Today is International Mountain Day, and we’re rather fond of beautiful scenery here at Google Sightseeing, so we think it’s great that we can access scenic vistas just by dropping Pegman into Street Views anywhere in the Alps, Pyrenees and other mountain ranges. 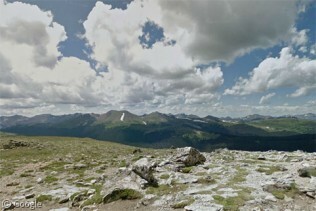 With the advent of Google’s backpack cameras we can even get stunning views such as this one of the Rocky Mountains in Colorado from a peak near the Alpine Visitor Center on the Trail Ridge Road. For more mountainy goodness, see our past posts about places such as Andorra, Norway and Switzerland.